*International flights are not included, but our team would be happy to connect you with our flight partner for assistance. The Galapagos Islands are home to some of the rarest animals on the planet and this trip gives the whole family a unique opportunity to learn about the biology and diversity of this paradise. Everyone will enjoy spotting the myriad of animals in their natural environment as they graze, sleep and play on the beaches, mountains and rocks of the islands of Santa Cruz and Cristobal as well as exploring the human history of Floreana. Snorkel with sea lions, marvel at the plodding majesty of giant tortoises, spot frigate birds, blue-footed boobies and Galapagos crabs – and keep an eye out for marine iguanas, whales, dolphins and sharks as you explore this natural wonderland. As well as exploring some of the archipelago's finest islands by boat, you'll get to know the locals by staying in small, friendly hotels. Snorkeling with sea lions is an incredible and surreal experience, and there are few better places to do so than Islas Lobos, home of the world's second largest sea lion colony. One of the joys of the Galapagos is to be surrounded by birds like boobies and frigatebirds who often have not even the slightest interest you're there. Incredible photo opportunities await around every corner – not least of Kicker Rock, the marvellous twin volcanic peaks seen sitting in the ocean from the top of Cerro Tijeratas. The colorful human history of Floreana, shrouded in mystery and mayhem, has a story for everyone. It's sure to be a hit with the family. With spare time in Quito and Isla Santa Cruz, you can spend quality time with the family – perhaps with further hiking or visiting local markets. Welcome to Ecuador. Sitting at an altitude of 9,000 feet, under the gaze of Volcan Pichincha, Quito is one of the most attractive cities in South America. Your adventure starts with a welcome meeting at 6 pm. You can arrive at any time as there are no activities planned this day. We'll be collecting your insurance details and next of kin information at this meeting, so please ensure you have all these details ready. 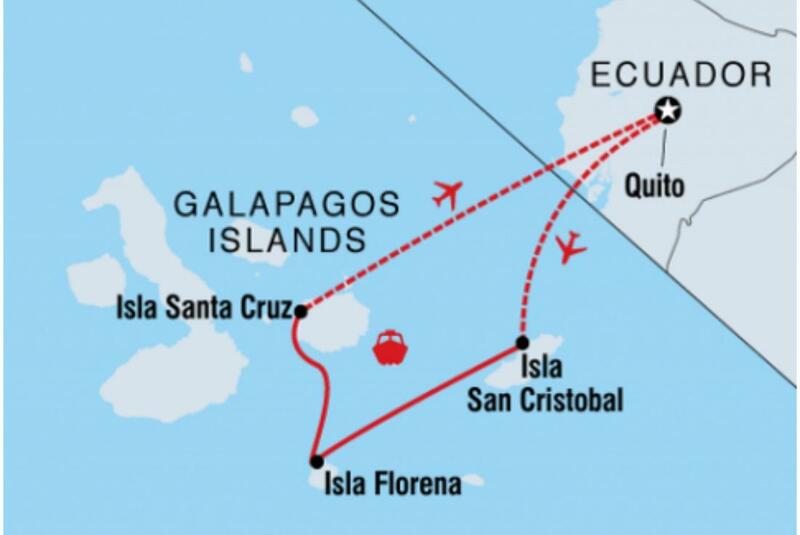 This morning you’ll be transferred to Quito airport for your flight to Galapagos Islands’ Isla San Cristobal (approximately 3.5 hours), departing sometime between 8:20am and 10:30am. Your flight (approximately 3.5 hours in total) will stop in Guayaquil to pick up more passengers. Landing at around midday, meet your naturalist guide who will transfer you to your hotel. In the afternoon, head to the Interpretation Center to learn about the history of the islands and the challenges local conservationists face. Then you'll head to the Cerro Tijeratas (Frigatebird Hill) which is located 1.25 miles from the interpretation center, southwest of Isla San Cristobal. It is a bit of a climb to the top, but your reward is an amazing view of the bay. From here you can see the 460-foot-tall volcanic beauty, Kicker Rock. Soon after you’ll travel to La Loberia to enjoy some snorkeling, perhaps spotting sea lions and sea turtles as you swim around. Notes: The Galapagos National Institute has introduced a mandatory Transit Control Card which will cost you $20. You will need to purchase this card upon arrival at the domestic airport on Day 2, prior to checking in to your Galapagos flight. Also, upon arrival to the archipelago you’ll need to go through immigration and pay the Galapagos National Park entrance fee of $100 in cash (preferably in small bills). Your second day in Isla San Cristobal begins with a short boat ride to Isla Lobos (approximately 1 hour or less). This island boasts the second-largest sea lion colony in the world and the tallest lighthouse on the entire continent. Along the way you’ll observe the abundant sea life that the Galapagos is renowned for, such as frigate birds and blue-footed boobies. On arrival, you can head out into the water for some quality swimming and snorkeling time. You might find yourself in the midst of turtles, manta rays and maybe the odd Galapagos shark (don't worry – they're harmless!). Then it's time to head back to base and relax. In the morning you’ll take off to Floreana Island, traveling by private speed boat (approximately 2.5 hours). Go for a snorkel and enjoy some lunch, then you'll head ashore to a black sand beach. Being the first Galapagos island to be inhabited, there is a colorful human history to be discovered in addition to its exotic wildlife. You’ll have the chance to read up on how life came to be on Floreana and how some lives mysteriously ended. Next, board your private speedboat once again and continue to Isla Santa Cruz, home to the largest town in the Galapagos Islands (approximately 1.5 hours). Today after breakfast you’ll go to the Charles Darwin Research Station. This not-for-profit organization has been operating since 1959. The station's visitor center is an essential stop for anyone interested in the archipelago's natural and human history and the local conservation. It also offers the chance for close-up encounters with giant tortoises – weighing as much as 900 pounds – and you can see many newborn and young giant turtles too. They're here as part of the breeding program to reintroduce the creatures to their natural habitat. In the afternoon you’ll venture to the higher part of Santa Cruz to observe giant tortoises roaming around in the wild. Today is a free day for you and your family to explore Isla Santa Cruz Island as you please. You might like to head out to Tortuga Bay beach, which is a fairly short walk away (approximately 45 minutes). The walk to the lovely Las Grietas gorge, past cactus fields and lava rock formations, is also a good choice. Alternatively, you can visit the buzzing local fish market, where pelicans try to get in on the daily catch. You might like to simply stay in Puerto Ayora, soak up the seaside ambience and make some of your own discoveries. The town itself is nice and small, perfect for exploring on foot. Today you’ll transfer to the airport for your return flight to Quito. You can expect to arrive at your hotel at around 3 or 4pm. Enjoy an evening exploring Quito, or perhaps kick back and relax. Today is full free day in Quito. Your local leader is happy to provide you with local tips on how to spend your time in Quito. Today your Galapagos tour comes to an end. Enjoy breakfast at the hotel with your family before your included transfer to the airport for your departure flight. Age restrictions apply to this trip: minimum age 5.